The building being leased by Starbucks at 4994 Newport, like the Strand also had historical significance. Built in 1927 as a branch office for the Bank of Italy, it incorporated graceful interior features including antique mahogany furniture, chrome iron tellers windows, and marble. 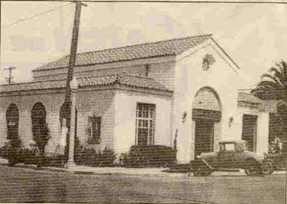 Ocean Beach Historical Society president Carol Bowers contacted Starbucks asking them to preserve the unique features of the building. She was told that a “design team” would contact her to address her concerns. While she was waiting for the call that never came she walked by the site and saw that the arched windows and loft that had housed the former vault had already been walled off. Trees that had been growing int he parking lot had been removed. “So much for Starbucks touted community involvement” she wrote in a May 24th editorial for the Beacon. Having been unable to find any significant community support for their plans, Starbucks regional director Greg Robers switched gears and began attacking the community. In a June 28th Beacon article Robers alluded to a BB gun firing at the building. Although no damage or injuries were reported Robers played it up calling it “a police matter” and blamed local activists for the alleged incident. With seemingly no sense of irony he cited his corporations “positive influence” on the community in the same article, which made no mention of anonymous threats made towards the Green Store and its organizers. Later that month on June 26th, another demonstration was held with the participation of the Organic Consumers Association. Although this protest was no different than any others that had occurred, what was different was an outlandishly large police response. A group of police on motorcycles filled Newport Avenue that day during the peaceful demonstration. The cost of the police presence during this week, with demonstrations surrounding the 2001 BioTech conference in San Diego was over three million dollars. “On Tuesday June 26th, at 7:30 pm, as I entered Robb Field, I saw a line of 20 San Diego Police Department squad cars parked and facing toward the Bacon Street exit of the park. Each car was filled to capacity with officers. There were other officers standing about on the grass, some in riot gear. When I asked if they were expecting a riot, my question was answered, “Why yes we are.” I thought Ocean Beach was a little far from the Bio2001 Convention to position police as a deterrent. I asked a female sergeant if they were there to protect the conference. She said they were there for the Starbucks protest! Now, my question to the Starbucks Corporation is, if police intelligence reports that opposition is so broad and so deep that, in order to protect their property, a hundred cops may be necessary to quell a riot, shouldn’t they reconsider the wisdom of opening their business in such a hostile environment? Ironically, during subsequent downtown protests of the BioTech conference, a group of black-clad individuals wearing bandanas incited the crowd to vandalize a corporate store-front. Much akin to the 1999 WTO protests which had resulted in the looting of a Starbucks location in Seattle. However, unlike the young Black Bloc activists who were responsible for that vandalism, these ‘anarchists’ were stocky mid-forties men, some with handlebar mustaches. Despite the urging by what were clearly undercover police disguised as anarchists there was no vandalism. For the remainder of 2001 ‘No Starbucks in OB’ articles continued to appear weekly in local media. In July the OB Town Council announced they would poll their membership on the question of Starbucks coming to OB. President Carol Smith had voiced her opposition to the campaign stating “Longtime locals do not share the feelings of the group that has been demonstrating.” In a June 28th 2001 San Diego Union Tribune article. But in August when the results came in a majority of Town Council members opposed the entry of Starbucks to Newport Avenue. On September 6th days before the OB Starbucks location was set to open a large group of businesses purchased an advertisement in the Peninsula Beacon highlighting the issue. The day that OB Starbucks opened was September 11th 2001. The opening had repeatedly been delayed. A neighbor who worked for Starbucks told me they couldn’t convince anyone local to work at this location and had to delay to continue their search to find workers willing to work in this location. The protest and opening began before the tragic events of that day. Both the workers and protesters struggled to understand what had happened as word of mouth began to spread. Although demonstrators had planned to keep a presence in front of the store for the day, the protest was brought to a close. That day the campaign was irrelevant. Days later Ocean Beach Grassroots Organization (OBGO) members met holding a long moment of silence contemplating the loss, trying to make sense of what had happened. In New York during that day’s disastrous events Starbucks exposed their corporate greed by charging rescue workers for bottled water used to save lives. Rescue volunteers stunned at the corporate callousness and insensitivity in the face of tragedy scrambled to pay the $130 demanded for three cases of bottled water. Later realizing they may have been over-charged they wrote Starbucks to complain. The complaints fell on deaf ears and they began circulating emails among their friends. These emails were later picked up by the media and turned into an international PR nightmare for the chain, with many calling for a boycott. Much has changed. Starbucks closed over 600 location in 2008 and cancelled 200 more. The twenty year old LA Times article describing Ocean Beach as a hippie throwback does not ring as true today. It is no longer free of Starbucks or million dollar mansions. OB retains much of its small town character yet many longtime businesses and residents have been forced out by rapidly increasing rental costs. Newport Avenue continues to inch away from being a village main street towards a tourist trap. A souvenir store instead of a theatre, another chain drug store instead of a grocery, a ‘hippie’ clothing store instead of a pet store. The replacement of Bohemians with Bohemian-themed marketing continues in what was the last affordable beach community. There is no greater symbol of this cultural appropriation than Starbucks. The coffee house has traditionally been a social hub, as well as an artistic and intellectual center. It’s a history that traces back to 14th century Turkey. The coffee houses of 17th and 18th century Europe were popular meeting places for writers, philosophers and activists. Café society as a passion instead of a marketing opportunity is championed by newspapers like San Diego’s The Espresso. This genuine cafe culture is still evident in establishments like Newbreak Café and Coffee where a unique group of regulars meet daily. Part of an actual community having lively conversations on local issues. Contrast this with OB Starbucks where WiFi access and even toilets are used as money making opportunities. OB’s independent coffee houses like Your Mama’s Mug, Lazy Hummingbird, Jungle Java, Newbreak and others are all unique, Starbucks are the same across the world, appropriating the cultural associations and imagery of café society to encourage consumption. Using invented language to give a $4 value to a cup of coffee and steamed milk. In Ethiopia, the birth place of coffee, farmers net about $120 a year. There are no Starbucks locations in sub-Saharan Africa. In another effort at cultural appropriation Starbucks has trademarked the names of Ethiopian coffee growing regions and fought to keep Ethiopians from establishing their own trademarks. Starbucks has gone to great lengths to green-wash its brand and steer discourse away from its questionable business, labor and environmental practices. That $4 dollar latte is worth $0.02 cents to the third world coffee grower, less than 1%. Starbucks has been sued for it’s anti-free enterprise practice of signing leases with the condition not to rent to other other coffee shops. They have been sued for unfair labor practices. Even singer Carly Simon has sued them (twice) for broken promises. Their marketing is designed to keep the producer’s issues invisible to the consumer’s conscience. Their continued cultural appropriation, community bullying, and lies hold their place as a poster child for corporate globalization. The ‘No Starbucks in OB’ demonstrations are over a decade old. The claims of the protesters and corporate supporters can now be examined with the advantage of hindsight. The OB Starbucks remains open, but at what cost to the corporate shareholders? For a company so concerned with brand image they seem to be more willing to operate the OB location at a loss than to admit they were never wanted. You can get the Starbucks-clone experience at Newport and Bacon available everywhere else. You can also get the only Rio Bowl in the world at Tiki Port on the corner of Cable and Voltaire. OB’s best açaí bowl, named after protest leader Rio Mezta. In the end OB activists succeeded in their campaign to educate local customers and keep business at independent cafes. The protests are long over but the boycott continues and the message still resonates. Marc Snelling is a former OBcean and OB activist who now lives near Ottawa, Canada, with his partner Alicia and their daughter Ava. Marc was a board member of the OB Planning Board as well as a founding member of OB Grassroots Organization. Also See a 4 Part Series the OB Rag published in 2011. Thank you Marc, for reminding me how much that campaign changed my life and the lives of many others. It brought us together as a community and solidified our convictions that our neighbors are more important than a dollar. Despite the continued presence of the global bully, we succeeded in many ways- perhaps it even stands as a constant warning of what could happen if we are not vigilant. Every time I walk past the eyesore, I am reminded to shop at local stores, whatever community I find myself in. Because after all, community is what it is all about. It was so much nicer when it was a vacant building with the smell of urine emanating from it. It sat vacant because the rent was raised and the landlords let it sit for years until someone would pay the new higher rent. If it needed cleaning up so bad then where were the property owner and manager? The statement in the UT had bothered me for years. My statement was “many longtime locals do not share the feelings of the group that has been demonstrating.” I knew there were some who wanted everything to stay exactly the same. It was true. I spoke with people on both sides of the fence on this issue and there were many who welcomed a business in the vacant building, and some looked forward to the convenience of their favorite coffee shop being nearby. There wasn’t much we could do. The property owner lived in Florida and really didn’t care how anyone felt. This was a business agreement. Starbucks attended the forum at the OB Rec where MANY shouted their feelings. It was a good protest, it was stressful to stay neutral, and I’m damned glad it’s over. Is there a bigger version of this photo? !